Some Christians hesitate to embrace the notion that the earth’s outer surface is moving—and moved even more dramatically during the Flood year. However, tremendous amounts of empirical data suggest significant plate movement occurred just thousands of years ago.1 Much of these data are independent of secular deep time and the geologic timescale. In addition, the catastrophic plate tectonics (CPT) model offers a mechanism for the flooding of the continents, the subsequent lowering and draining of the floodwaters, and a cause for the post-Flood Ice Age. Geologists derive the theory of plate tectonics from much data collected over many decades. In the early 20th century, Alfred Wegener examined how the continents seem to fit together like a puzzle and matched fossils and mountain ranges across vast oceans to suggest that the continents had split in the past. At the time, his ideas were ridiculed and ignored. It was not until the 1960s, after immense quantities of oceanographic data were collected, including the publication of Harry Hess’ hypothesis of seafloor spreading2 and J. Tuzo Wilson’s early work on plate tectonics,3 that secular geologists slowly accepted these ideas. Nearly 50 years after Wegener first proposed the concept of continental drift, the secular community was overwhelmed with empirical data and reluctantly acknowledged plate tectonics. If continents split, we should find evidence to support these movements under the oceans. In the 1950s and 1960s, geologists discovered that the ocean crust is very young compared to many of the rocks on the continents. In fact, the oldest ocean crust goes back to a brief episode in the Flood during the deposition of the Jurassic system. And at every ridge, the crust gets systematically older in both directions. 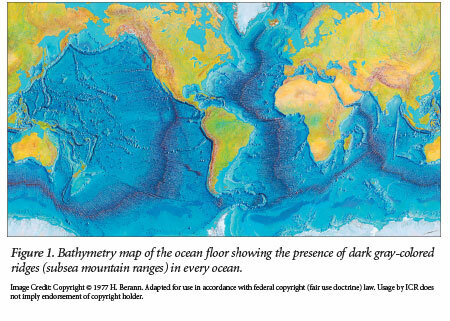 Although secular ocean floor maps claim ages in millions of years, they do seem to be correct in a relative sense. Older age dates usually indicate older rocks. In addition, a tremendous amount of data affirms seafloor spreading independent of absolute dating methods. 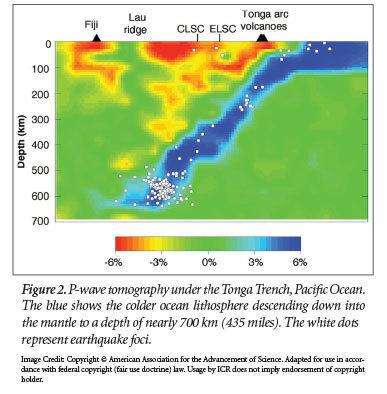 (a) The temperatures recorded from wells in the ocean crust and the heat flow measured near the ocean ridges show a systematic pattern of cooling with distance from the ridges in both directions. Sclater and Francheteau originally defined a relationship between heat flow and distance from the ocean ridge in 1970 that still holds today.4 This empirical data set is not dependent on any dating methods, absolute or relative. (b) The magnetic reversal “stripe” pattern shows symmetry on each side of the ocean ridges, supporting simultaneous seafloor spreading outward in both directions from the ridges. The overall symmetry to this data cannot be merely dismissed. The patterns initially observed by Heirtzler and his colleagues for the ridge southwest of Iceland show a near-perfect symmetry for 200 km in both directions about the ridge.5 The raw magnetic anomalies are based only on distance from the ridges and not on the secular ages of the rocks. (c) The presence of the ocean ridges suggests a common origin by seafloor spreading. Ocean ridges are found in every ocean of the world (Figure 1). The ridge system extends 45,000 miles, connecting all of the seas. They consist of huge, linear mountain chains rising 10,000 feet above the abyssal plains with a rift valley at the center, actively spewing out basaltic magma. Empirical data, independent of the chronostratigraphic timescale, demonstrate that the modern ocean lithosphere was completely recreated in a conveyor-belt fashion at the ridges during the Flood, causing systematic spreading in both directions. 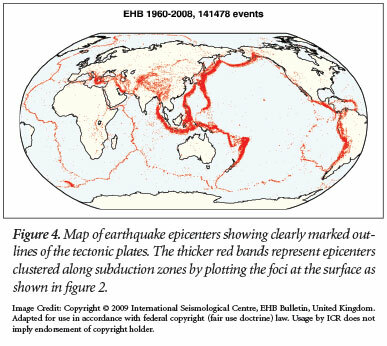 Maps of current earthquake activity define the boundaries of the majority of the plates (Figure 4). Earthquake epicenters still clearly trace the boundaries of discernable and coherent lithospheric plates even today, nearly 4,500 years after most of the plate movement ceased. Further support for these plate boundaries is shown by the linear chains of volcanoes found along the edge of the Pacific plate, associated with the Pacific Ocean’s “Ring of Fire.” In addition, many of the major mountain ranges of the world also follow the edges of active plate boundaries, such as the Andes and Himalayas. These long, linear chains of mountains run parallel, and in close proximity, to many of the convergent-style plate boundaries. This explains many of the world’s largest and deepest earthquakes. Subsequent cooling of the newly created ocean lithosphere later in the Flood year (after Day 150) offers an explanation for the lowering of the floodwaters. The 62-mile-thick ocean lithosphere cooled and sank, lowering the bottom of the oceans and drawing the water back off the continents and into the ocean basins. Creation geologists who advocate CPT do not claim to understand all aspects of the theory, but they accept it as a sound working model steeped in empirical data. Secular and creation scientists alike debate how subduction is initiated15 and how the major continents originated,16 but most do not use this lack of understanding to question the overall validity of plate tectonics and/or the CPT model. Catastrophic plate tectonics presents a mechanism that explains much of the geology that scientists observe and measure. 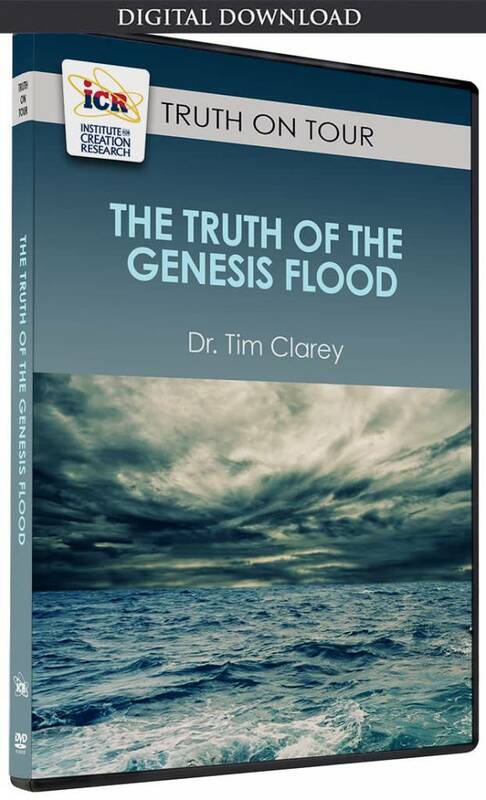 The overwhelming geological evidence supports the conclusion that catastrophic plate movement occurred just thousands of years ago and contributed to the flooding of the earth. A large portion of this article was published in Clarey, T. L. 2016. Empirical Data Support Seafloor Spreading and Catastrophic Plate Tectonics. Journal of Creation. 30 (1): 76-82. Hess, H. 1962. History of Ocean Basins. In Petrologic studies: a volume in honor of A. F. Buddington. A. Engel, H. James, and B. Leonard, eds. Boulder, CO: Geological Society of America, 599–620. Wilson, J. 1968. A Revolution in Earth Science. Geotimes. 13 (10): 10–16. Sclater, J., and J. Francheteau. 1970. The implications of terrestrial heat flow observations on current tectonic and geochemical models of the crust and upper mantle of the Earth. Geophysical Journal of the Royal Astronomical Society. 20: 509-542. Heirtzler, J., X. Le Pichon, and J. Baron. 1966. Magnetic anomalies over the Reykjanes Ridge. Deep Sea Research. 13: 427-433. Schmandt, B., and Fan-Chi Lin. 2014. P and S wave tomography of the mantle beneath the United States. Geophysical Research Letters. 41: 6342-6349. Brown Jr., W. 2008. 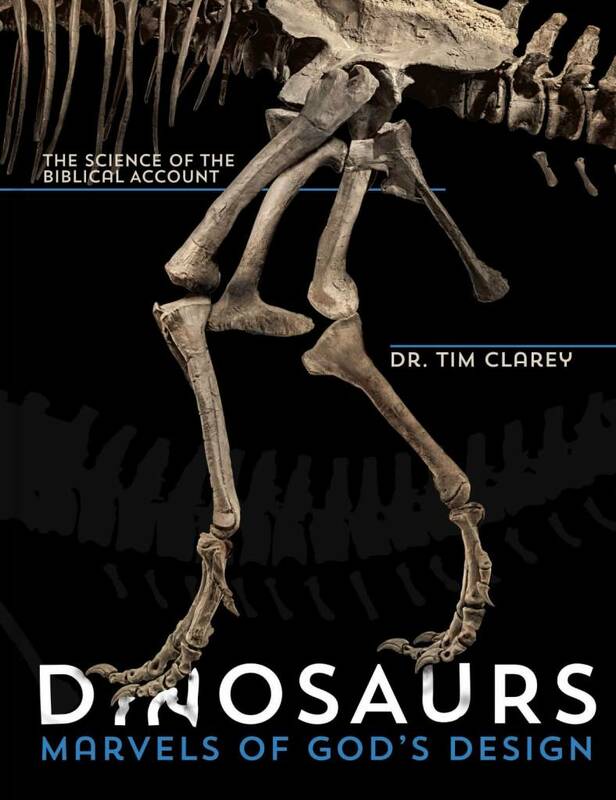 In the Beginning: Compelling Evidence for Creation and the Flood, 9th ed. Phoenix, AZ: Center for Scientific Creation. Baumgardner, J. 1994. Runaway Subduction as the Driving Mechanism for the Genesis Flood. In Proceedings of the Third International Conference on Creationism. R. Walsh, ed. Pittsburgh, PA: Creation Science Fellowship Inc., 63-75. 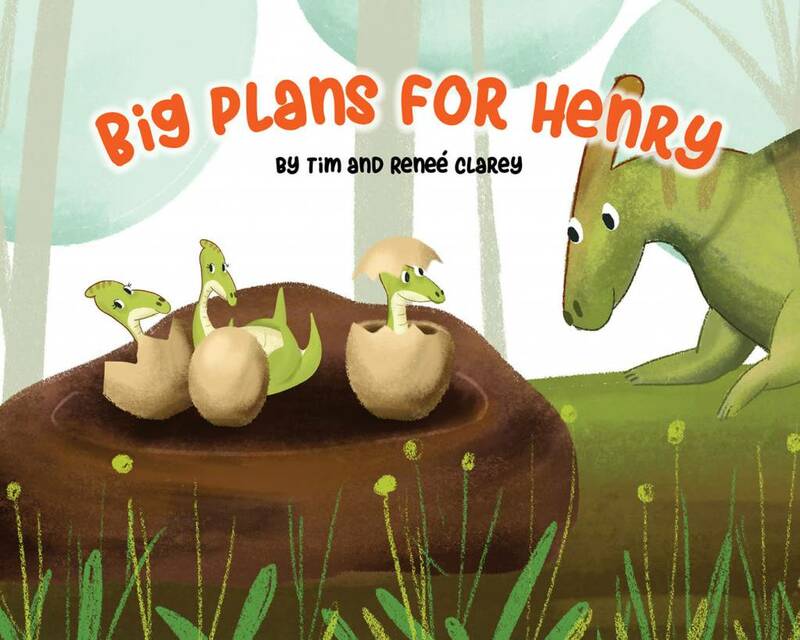 Clarey, T., et al. 2013. 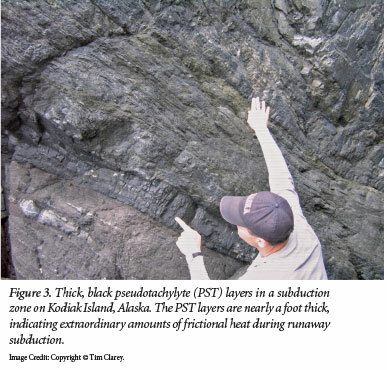 Superfaults and Pseudotachylytes: Evidence of Catastrophic Earth Movements. In Proceedings of the Seventh International Conference Pon Creationism. M. Horstemeyer, ed. Pittsburgh, PA: Creation Science Fellowship Inc.
Reed, J. 2000. The North American Midcontinent Rift System: An Interpretation Within the Biblical Worldview. St. Joseph, MO: Creation Research Society Books. Snelling, A. 2014. Geophysical issues: understanding the origin of the continents, their rock layers and mountains. 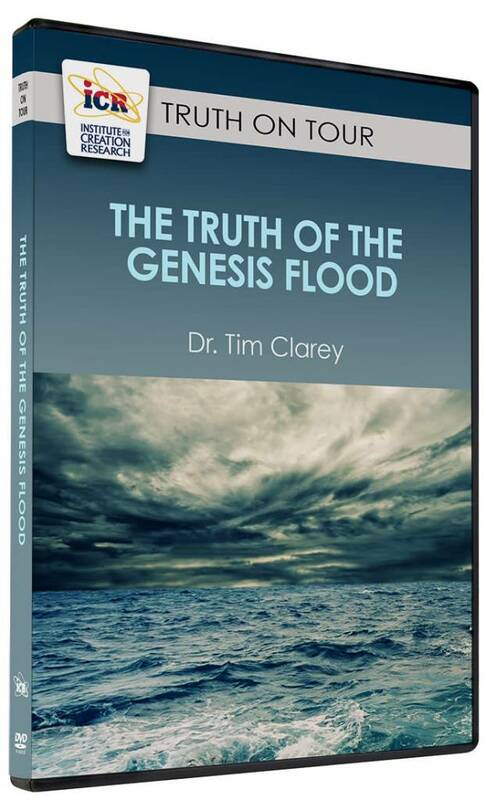 In Grappling with the Chronology of the Genesis Flood. S. Boyd and A. Snelling, eds. Green Forest, AR: Master Books, 111-143. Baumgardner, J. 2016. Numerical Modeling of the Large-Scale Erosion, Sediment Transport, and Deposition Processes of the Genesis Flood. Answers Research Journal. 9:1-24. Oard, M. 2004. Frozen in Time. Green Forest, AR: Master Books. Raymond, L. 1995. Petrology: The Study of Igneous, Sedimentary, and Metamorphic Rocks. Dubuque, IA: William C. Brown Communications. Marques, F., et al. 2014. Subduction initiates at straight passive margins. Geology. 42 (4): 331-334. Hecht, J. 2015. Rise of the upper crust. New Scientist. 226 (3017): 36-39. 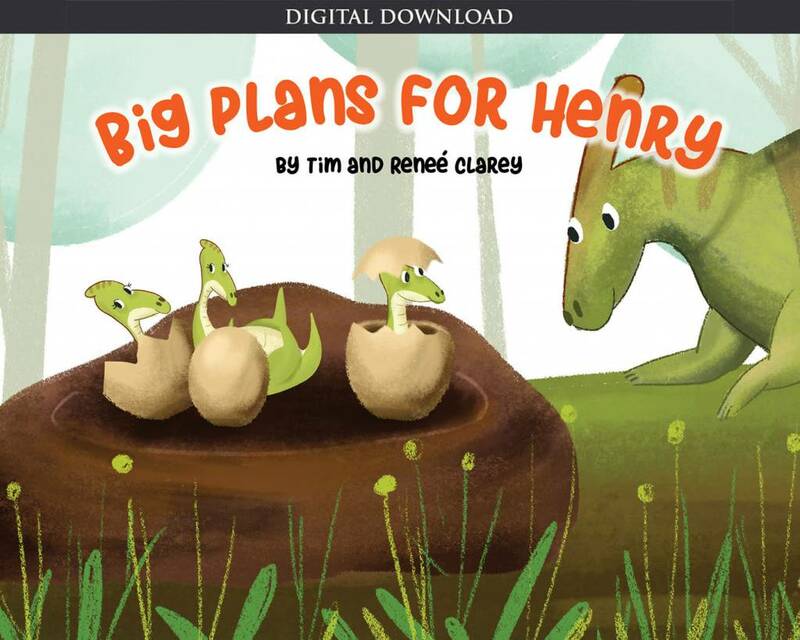 Cite this article: Tim Clarey, Ph.D. 2016. Embracing Catastrophic Plate Tectonics. Acts & Facts. 45 (5).